A Sadar Court for the Province of Sindh was established by Bombay Act XII of 1866. 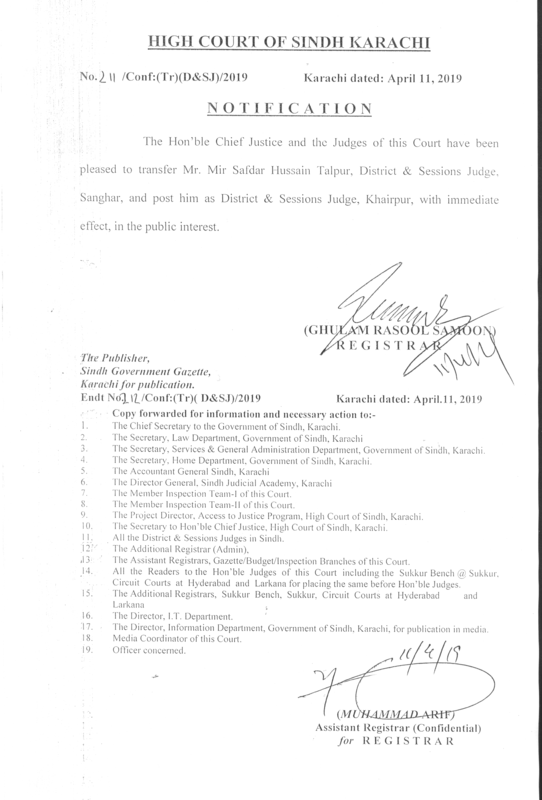 This Sadar Court was the Highest Court of appeal for Sindh in Civil and Criminal matters and was presided over by a Judge called the "Judicial Commissioner of Sindh". In 1906 the Bombay Act XII of 1866 was amended by the Sindh Courts Amending Act (Bom. I of 1906) and the Sadar Court was converted into the Court of the Judicial Commissioner of Sindh consisting of three or more Judges. Apart from being the highest Court of Appeal for Sindh in civil and criminal matters, the Court was the District Court and the Court of Session in Karachi. On 21st August, 1926 the Sindh Courts Act (Bom. VII of 1926) was passed into law-making provision for the establishment of a Chief Court for the Province of Sindh. On the coming into operation of Part III of the Government of India Act, 1935, on 1st April, 1937, Sindh became a separate Province and the Judges of the Court of Judicial Commissioner of Sindh were appointed by Royal Warrant by the British Government. 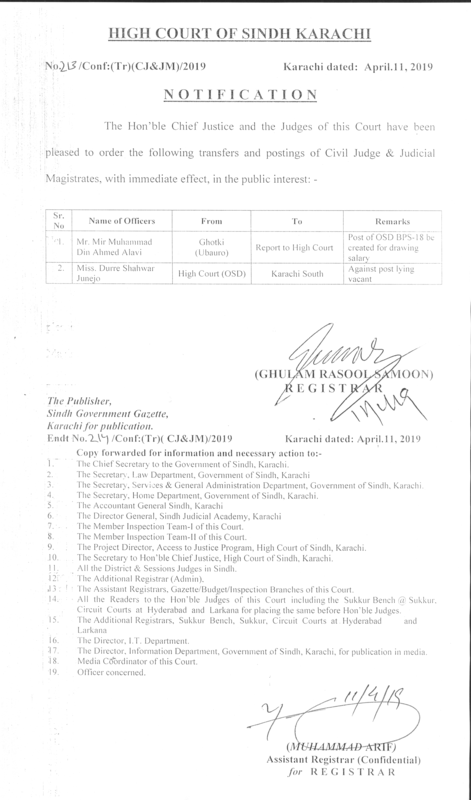 As the Sindh Courts Act, 1926 followed closely the lines of the Letters Patent of the Bombay High Court, it was felt that the immediate need of the Province could be satisfied by bringing that Act into operation thereby raising the status of the Court to that of the Chief Court of Sindh. 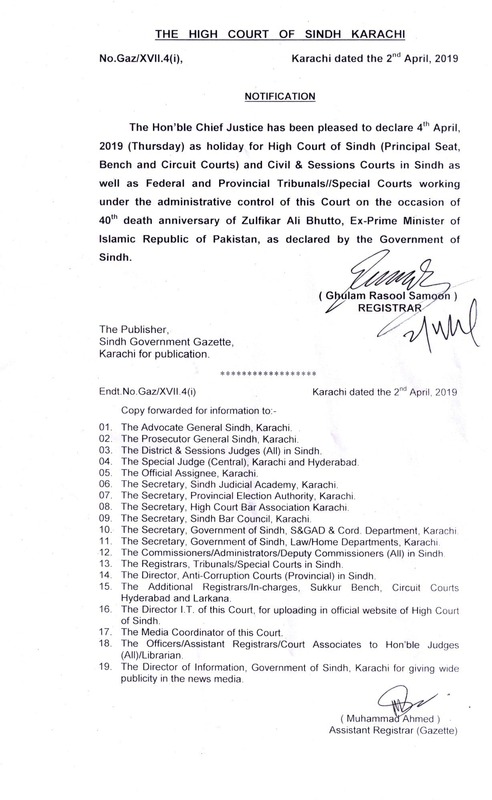 Ultimately the Government of India Act, 1935, was suitably amended by Parliament and on 15th April, 1940 the Sindh Courts Act, 1926, was brought into operation and the Court of the Judicial Commissioner of Sindh became on that day the Chief Court of Sindh. In 1907, the Court consisted of a Judicial Commissioner, and three Additional Judicial Commissioners. However, in 1935, the number of Additional Judicial Commissioners was increased from 3 to 4, and in that year the following were the Judges. 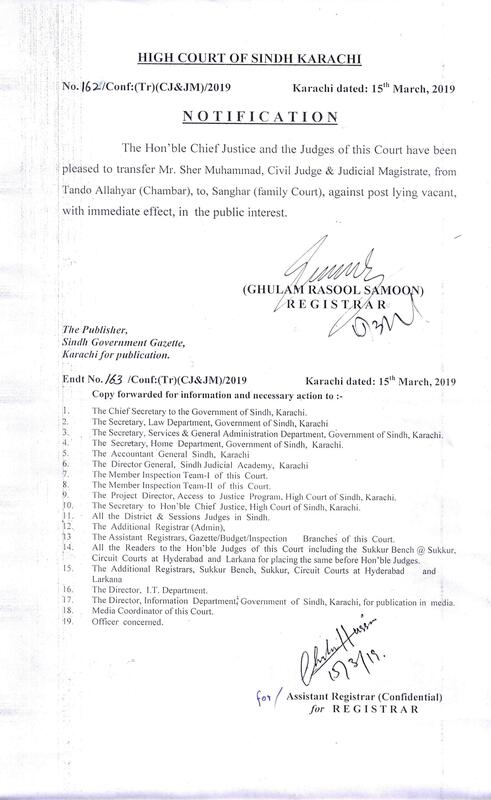 Judicial Commissioners of Sindh V.M. Forrers, Esq., I.C.S. (Retired, May 1935). Godfrey Davis, Esq., I.C.S. (From June, 1935) Additional Judicial Commissioners of Sindh Rupchand Bilaram, Esq., B. A., LL. B. Dadiva C. Metha, Esq., M.A., LL. B. M.A. Havelivala, Esq. Bar-at-Law. Charles M. Lobo, Esq., B. A., LL.B. (Officiating). In 1937 the Judicial Commissioners, by the Order in Council were designated as the Judges. Significantly for the first time that in 1938 a Muslim namely, Mr. Hatim B. Tyabji, Bar-at-Law was appointed as the Acting Judge of the Court. 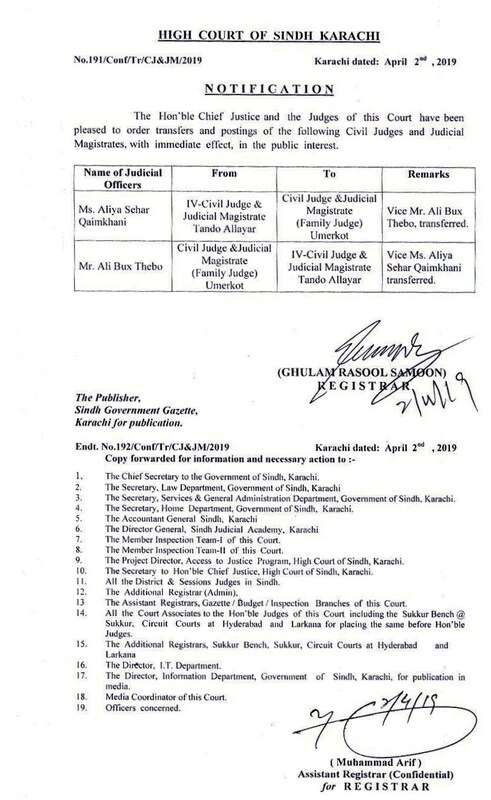 In 1947 Mr. Hatim B. Tyabji became the Chief Judge of Sindh Chief Court and the Court consisted of the following Judges. The Hon'ble Mr. Dennis Nail O'Sullivan, Bar at Law. The Hon'ble Mr. T. V. Thadani, Bar-at-Law. The Hon'ble Mr. George Baxandell Constantine,B.A. (Oxen), I.C.S., Bar-at-Law. The Hon'ble Mr. Hassanali G. Agha, B.A. LL.B. The Mr. Maneksha Rustomji Mehar, I.C.S. (Offg.)" 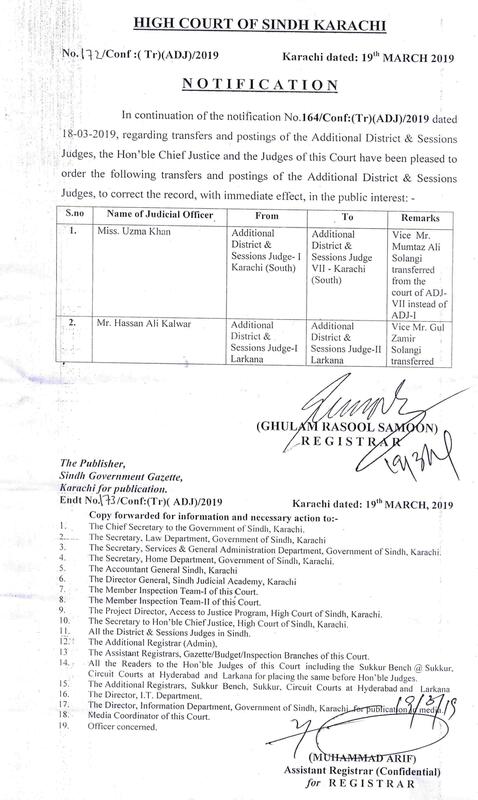 At the time of establishment of the High Court of West Pakistan the number of the Judges of the Karachi Bench was almost the same but subsequently it was increased to 15 and on separation of Sindh & Baluchistan High Courts 12 Judges were allocated to the Sindh High Court and 3 Judges to Baluchistan High Court. The present approved strength of Judges is 40. The construction of existing main building was commenced in 1923, at an estimated cost of Rs. 39,75,248 but it was completed on 22-11-1929, at actual cost of Rs. 30,35,000. This building which was meant for 5 Judges with some provision for expansion in 1929 is now accommodating Benches, Court Rooms and 18 Judges in Chambers. Some Judges have to hold Courts in Chambers. Besides, it also provides accommodation for the offices of the Attorney-General, Deputy Attorney-General,Federal Shariat Court Registry, Advocate-General, Sindh, Additional Advocate General, Sindh, Assistant Advocate General, Sindh and High Court Bar Library. Before shifting Supreme Court Registry from High Court premises two Court rooms and three Chambers were used by the Supreme Court Judges. When the Supreme Court comes to Karachi in bigger strength some more chambers are provided to the Judges of the Supreme Court. In 1974, An Annexe Building on the North-East side of the compound of the High Court was constructed at a cost of Rs. 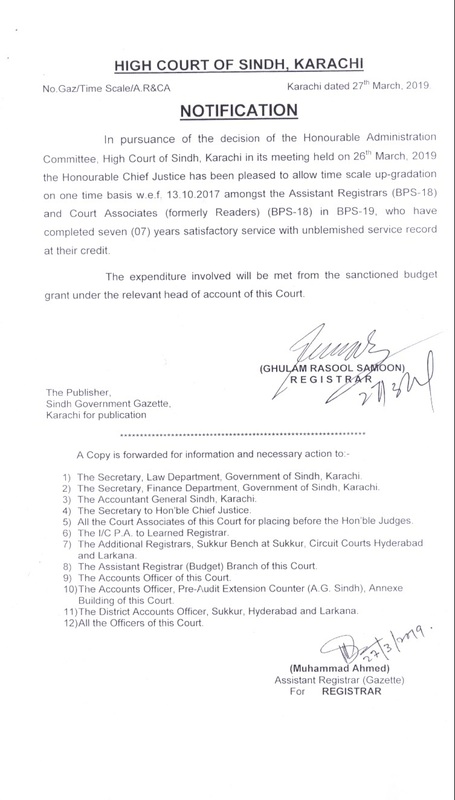 4.4 Millions but it did not ease the situation much, for it is accommodating the offices of this Court and also provides office accommodation for the Secretary, Ministry of Justice and Parliamentary Affairs, Standing Counsel, Official Assignee, Special Banking Court, Registry of the Federal Shariat Court and Sindh Bar Council. Thus, it will be seen that there is acute shortage of accommodation. 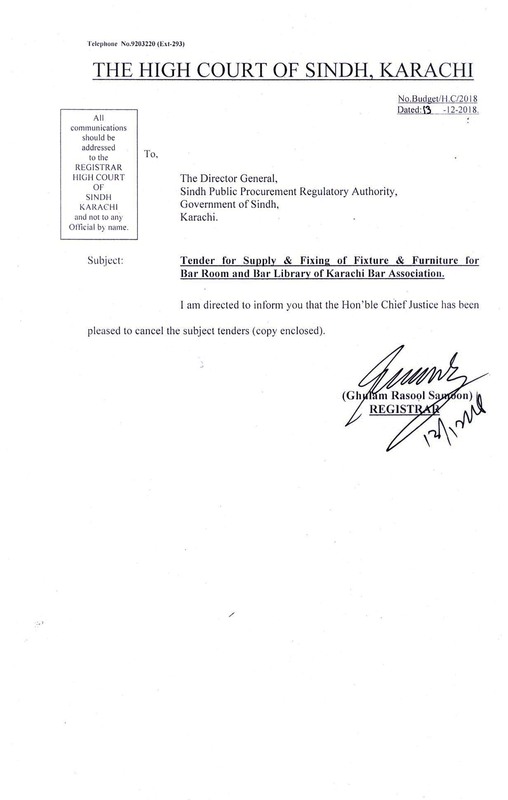 The provincial Government has allocated a token amount of Rs. One Lac few years back for construction of Annexe Building of South-East of the present building in order to make the scheme as ongoing scheme. The building was estimated in 1984 to cost a sum of Rs. 13.35 millions. The cost now may go up slightly because of inflation. Unless the Federal Government provides funds or the Provincial Government give preference to the construction of this building and provide necessary funds, the building is not going to be completed within a year or two. After the 18th amendment to the constitution of Pakistan 1973, a Judge of High Court is appointed according to the Article 175(A). 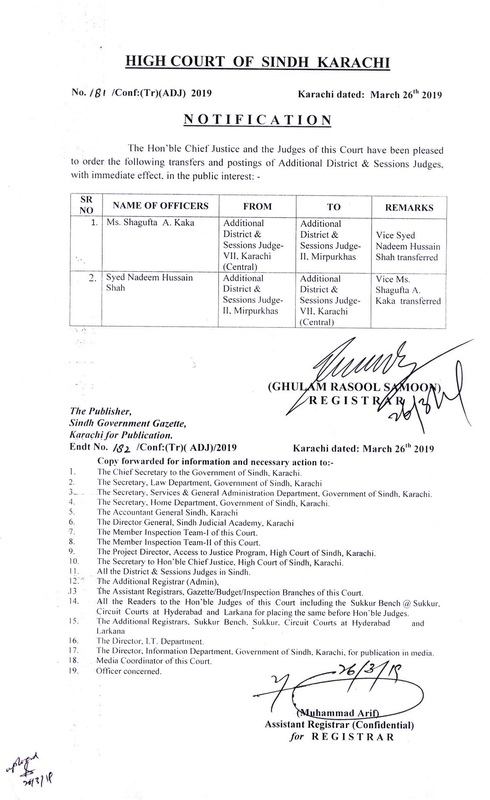 According to the Article 175(A), a Judicial Commission, chaired by the Hon'ble Chief Justice of Pakistan recommends the names of eligible persons to be appointed as Judge of High Court. The nominations are forwarded to the parliamentary committee. The Parliamentary Committee confirms the nominee by majority within fourteen (14) days otherwise the nominees shall be deemed to have been confirmed. The confirmed names are forwarded to the Prime Minister who forwards the same to the President of Pakistan for appointment. 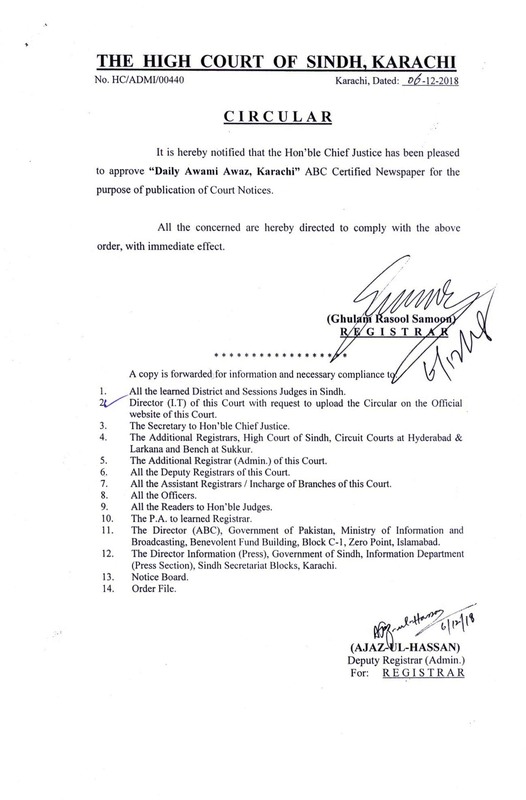 No person is appointed as a Judge of the High Court unless he is a citizen of Pakistan having forty years and has been an advocate of the High Court or has held a judicial office for ten years and has for a period of not less than three years served as or exercised the functions of a District Judge in Pakistan. A Judge of a High Court holds office until he attains the age of sixty-two years, unless he sooner resigns or is removed from office in accordance with the Constitution. Note: -The details of Article 175(A) Appointment of Judge may be seen at the website of the Supreme Court of Pakistan (www.supremecourt.gov.pk). 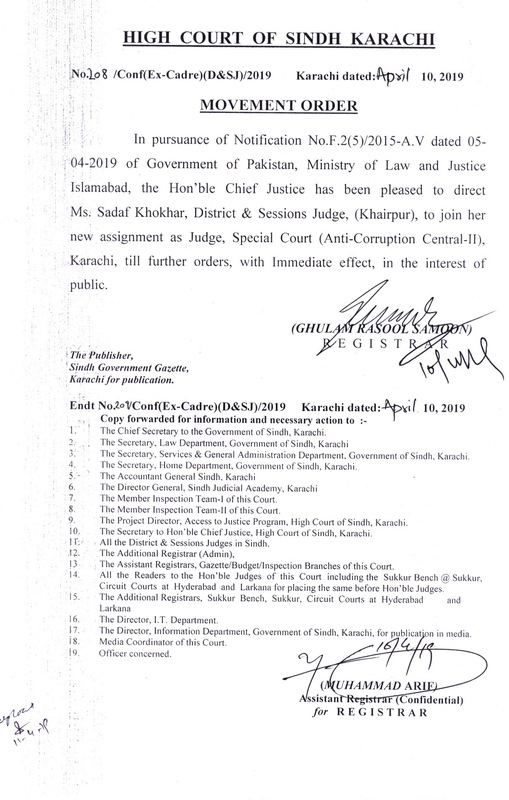 The principal seat of the High Court of Sindh is at Karachi with a Bench at Sukkur and Circuit Court at Hyderabad and Larkana. The High Court may have more Benches at other places as the Governor on the advice of the Cabinet and in consultation with the Chief Justice of the High Court may determine Jurisdiction.